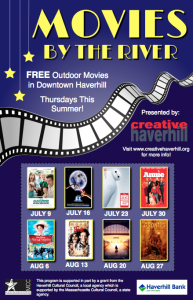 Creative Haverhill is pleased to announce a new outdoor summer movie series coming Thursdays this summer to Downtown Haverhill! Bring a chair, and come on down! 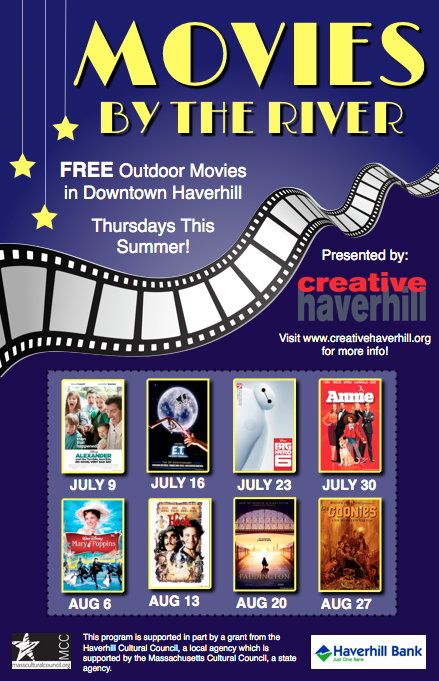 “Movies by the River” is a FREE outdoor summer movie series coming to downtown Haverhill, MA. A variety of new releases and family favorites will be shown on Thursday nights throughout July and August. All movies are PG or G rated. This movie series is designed to provide free entertainment in Haverhill and to bring the community together. So invite your friends bring some chairs and snacks, and make an evening of it! Movies will be shown every Thursday at dusk starting on July 9th and ending August 27th in the municipal parking lot next to Haverhill Bank on Merrimack Street. *Rain location is the Citizen’s Center. The movies will take place in a parking lot so be sure to bring a chair to sit in! Snacks, blankets, and an optional donation toward next year’s movies are some other ideas! The schedule for movie is as follows. All films are rated PG or G.